Is IPOWER a good web host? Read our complete review on IPOWER web hosting here! - Special Promotion: US$3.25 per month now. Limited time only! IPOWER (formerly known as iPowerWeb) is a California eCommerce web hosting provider founded in Year 1999 with offices at Santa Monica-California, Phoenix-Arizona, Montreal-Canada and London-United Kingdom. Today, IPOWER has over 700,000 customers from over 150 countries. Not surprisingly, IPOWER was awarded the "Best Web Host of the Year" award for 2003 and is the world's leading eCommerce web hosting provider. IPOWER provides reliable web hosting experience, free domain name hosting, first-rate price/quality hosting plan and outstanding customer service & support. Now, let's look at what are the hosting features that you will get for the price of US$7.95 $3.25 per month. Multiple Domains - IPOWER now allows you to host unlimited domains on single account. A lot of saving if you have many websites! e-Commerce Ready - IPOWER's Pro Plan Package not only is an excellent choice for entry level website but also for anyone who plans to develop a business website that requires e-commerce support such as shopping cart and shared Secure Sockets Layer (SSL) for online payment. There are three e-commerce features to choose from: osCommerce shopping cart, Agora shopping cart and PayPal shopping cart. Here is a sample live shop running on osCommerce. You get all these e-commerce features for free when you sign-up the Pro Plan package! You would have to pay extra or sign-up a higher premium plan in many other web hosting providers just to get the e-commerce features. Web Design Template - Don't know how to design web pages? Don't worry, IPOWER offers 'Web Builder' feature to help you to create professional looking website in five simple steps without having any HTML skills. All you have to do is first select a template category, then select a template and color scheme, follow by adding your company name and slogan. After you preview it, you are ready to publish your designed site. 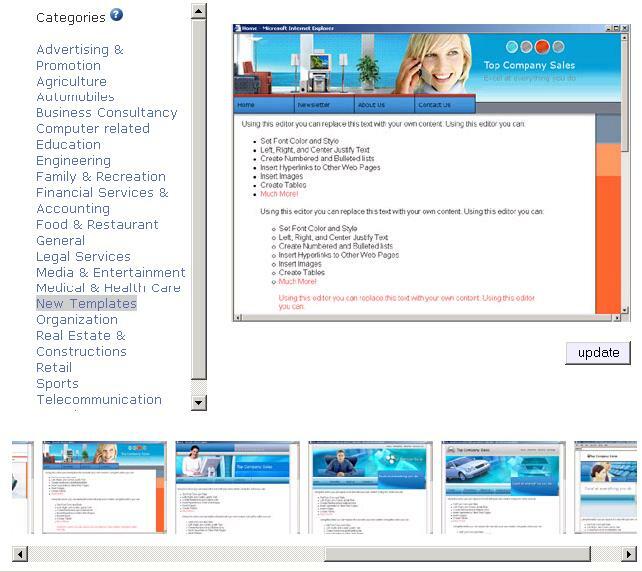 Here is just a snapshot of a template in Web Builder under 'New Templates' category. There are more templates for you to choose under other categories such as Retail, Engineering, Computer and etc. Power Plug-Ins - Want to add more features into your website without programming? Now, you can create 'web form', Bulletin Board, Guestbook, Chat, PHP Nuke, Blog, simple search, and even poll system with only just few mouse clicks using the 'Power Plugins' feature. You can add these plug-ins right from the administrator control panel. The only problem with these plug-ins is that they are very 'basic'. It will require some modification to the programs in order to make it more user friendly or to match your website look and feel. Practically, it is not really just a simple 'plug-in'. Marketing & Promotion - IPOWER understands the important of search engine marketing. Therefore, they provide keyword and Meta Tag generator for you to create web pages that optimized for search engines. In addition, they also provide Search Engine Auto-Submitter tools to simplify your search engine submission up to 40 popular search engines. Moreover, their 'Search Engines Positions Report' helps you to track your website ranking position on the search engines. Similar marketing and promotion service offer by other web hosting providers could easily cost you $49.95/year, but you get this for free when you sign-up the Pro Plan package. On top of that, you also get US$50 advertising credit at Yahoo! Search Marketing (previously called Overture) and US$25 Google AdWords credit for your Pay-Per-Click advertising. Content Plug-Ins - Worry about what contents to put on your website? IPOWER's content plug-ins allows you to feed various contents such as Daily News, Business and Finance, Sports content and even jokes or entertainment directly into your website. Depending on the theme of your website, you may or may not use this feature. For example, we don't use this feature in our website. With over 150 customer facing staffs supporting you, you can expect good customer support from IPOWER. 24/7 email support - IPOWER offers exceptional email support on various categories such as billing, support or abuse issues. Their support ticket system allows you to track your problem status and you can always expect to receive their reply promptly. 24/7 Toll-Free Phone - IPOWER provides 24/7/365 toll-free telephone support at their main line: 888-511-HOST (888-511-4678) for customers in US & Canada. For International customers, you can reach IPOWER at non toll-free number: 310-314-1608. IPOWER Interactive Flash Tutorials - Last but not least, you can view online interactive flash media tutorials on setting up and configuring your website. IPOWER Knowledge Base - In the Customer eService Center, you can find IPOWER extensive Knowledge Base for answers to common questions. You can search by product, category, keywords, or phrases to find the answer to your problem. Live Chat - IPOWER offers live chat which powered by 'LivePerson'. Whether you are existing or potential customer, you can always chat online with their friendly support staffs on any issues. 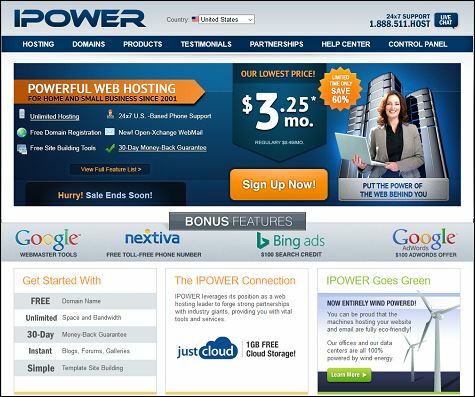 IPOWER, a California eCommerce web hosting company, owns two data center facilities at Los Angeles, CA and Phoenix, Arizona. It also has 2 collocated data center facilities from AT&T and Cable & Wireless. IPOWER use best of breed equipment like Dell™ PowerEdge and HP ProLiant™ Servers, Cisco™ Firewalls and Routers and premium bandwidth through their partnership with AT&T, Cable & Wireless, Qwest and AboveNet. Their two world-class quality Tier 1 Internet Data Centers are optimized to provide an industry-leading web, data, and applications hosting environment. These centers are designed to stay up and running, protected from power failure, physical intrusion and network outages by extensive back-up power and cooling systems, multi-layered security, and network redundancy and diversity. Their Data Centers are connected to the Internet using the highest performing OC48/OC192 IP backbone available with daily tape backups and 24/7 network monitoring. That explained why IPOWER is rated "Top 3 - Most Reliable Hosting Company" by Netcraft.
" Now I see why you are rated #1 provider by customers. Your tools are great. I'm a web rookie, and I was able to utilize your tools and upload our site in a matter of minutes. Your documentation is great and your response times are excellent, and your costs minimal. I was even able to set up my email account on outlook myself. I'll definitely recommend your services to every one I meet who needs web hosting. Thanks a bunch. " " Your service and support are 1st Rate, and I'll never go to another web host. Everyone I have spoken with at your company has been extremely helpful especially Anthony in tech support and Danny in sales. The speed of the servers is great and you just can't beat the features you guys provide. Keep up the good work guys!!! " 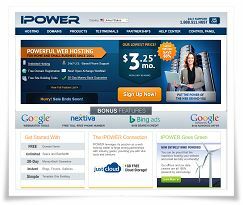 IPOWER basic hosting plan, Pro Plan, is the #1 selling web hosting solution on the Internet for two years in a row now. No matter what your budget or technical expertise, IPOWER Pro Plan hosting solution is a perfect fit for entry level website as well as ideal for setting up virtual shop on the Internet. If there is a fault to IPOWER's Pro Plan, it is that there are too many features provided that you may not required for your website. But otherwise, if you are looking for a reliable web hosting provider with good customer support and superb hosting features, you can't go wrong with IPOWER that has over 700,000 customers. Offering up to unlimited disk space and bandwidth plus hosting unlimited domains on single account make web hosting with IPOWER a real steal.